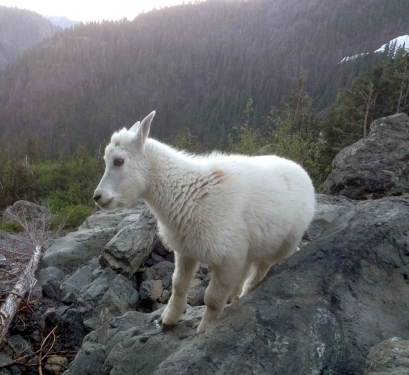 I’m don’t know if Bram Stoker and Mary Shelley were climbers, but I think they must have been inspired by mountain goats. Beautiful, powerful, and mysterious, the mountain goat stalks you through the fog, defies gravity astride the icy cliffs, and will buck you to oblivion on a whim. Also he longs for your salty fluids, so don’t pee near camp. 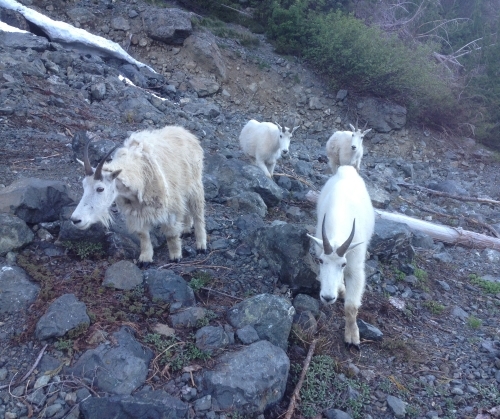 Last weekend, the first of many goats first joined us as we made base camp at 4,400 feet on our way up The Brothers. The welcoming committee consisted of a big billy, a shedding nanny, two wary juveniles, and a very cute kid that scampered around just like a puppy. They milled about us for about an hour while we sat patiently, holding our pee. Then just after midnight, I was awakened by a sound in the rocks. Two adults and one juvenile appeared in the moonlight and came within a few feet of our party, sacked out as we were in four bivy bags. I clanked my ice axe on a rock nearby to scare the them off. Which had absolutely no effect. Another hour passed before they left us to investigate the climbers in the main base camp 1000 feet below. And then it was morning and the push to the summit. The goats allowed us to ascend all the way to their ambush in a narrow chute known as the hourglass. At this point, rocks began to hurtle toward us–I assumed from a clumsy mountaineer above. The proper climbing etiquette is to yell “rock” whenever you kick something loose to warn anyone below. But no one called down to us, so we bellowed something about our presence up through the chute. More rocks came, bigger rocks, one of which struck me so hard in the middle of the thigh my whole leg stiffened up. Then the Goat of the Baskervilles slowly stuck his head into view. He had nearly killed us. He looked amused. In fourteen years of climbing The Brothers, I have only encountered a single mountain goat there before. We must have seen twenty this weekend. Even with the rock kicking and the pee sniffing, they are fantastic to encounter. But I also know what can happen because I have read Three Billy Goats Gruff and it does not turn out very well for the troll.